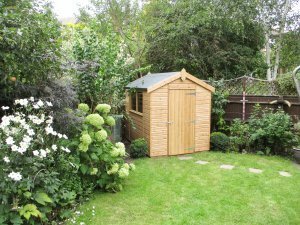 The Classic is a simple, traditional garden shed that is hand-built to a high standard in our Norfolk based factory. It comes in 7 standard sizes, in either a pent or apex roof design, and there are three paint colours or a stain to choose to finish it off. 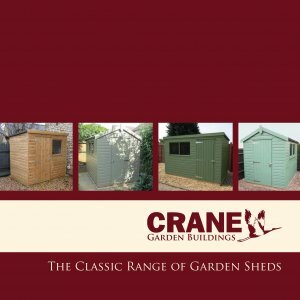 For a more bespoke service, please see our Superior Shed range, or to price your ideal Classic Shed, please click on the Create my Shed tab below. 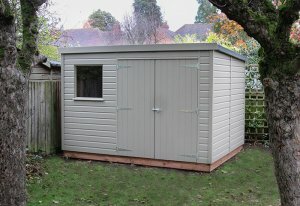 If you require a different size, please visit our Superior Shed page. Choose either a pent or apex roofed design to suit your space and personal requirements. You can then decide where you would like your doors and windows, and any extra options, such as paint or guttering. 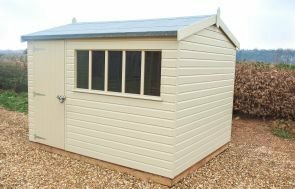 Please note: If you would like a door or doors in the side of a shed with an apex roof, please see our Superior Shed range, which has a taller eave height to allow for this configuration. Our ledged and braced doors are all made in-house by our joiners, ensuring the high quality that we expect is met. With our Classic range you can choose from either a single or double door set, depending on your needs. The windows are also made in-house by our joiners: they measure 610 x 610mm (2’ x 2’), set in a joinery-made window frame, and are finished with 4mm toughened safety glass. You can choose to have opening windows, if you wish, or no windows at all, if that is your preference. The Classic single door is ledged and braced, and it measures 760 x 1700mm opening. You can opt for a double door set if you need to move large items in and out of your shed with ease. A double door set measures 1520 x 1700mm opening. 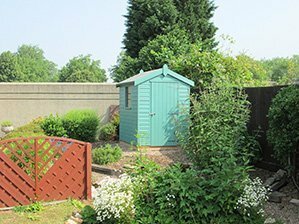 If you're planning on using your shed as a workshop, choosing to have opening windows will allow fresh air inside as you work. 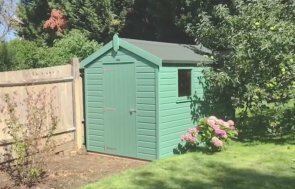 Our Classic Sheds come treated with a light oak wood preservative as standard, which protects the timber from fungi and woodworm, and gives a natural looking sheen. 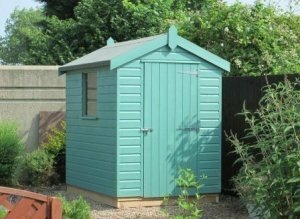 We also offer three paint colours to choose from with our Classic Paint range: Mint, Moss or Stone, which give an opaque coverage and will add a splash of colour to your shed. 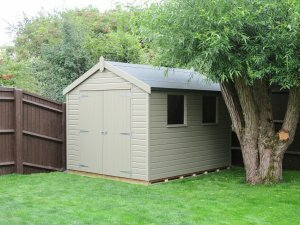 To make your new shed truly suited to your needs, you also have the choice of adding guttering and/or a workbench. Add guttering to collect any water run-off from the roof and to stop the bottom boards from rotting prematurely, or add a workbench to aid with your DIY or hobby needs. We add the guttering and a downpipe along both eaves of an apex roofed shed, and on a pent roofed shed we add the guttering and downpipe along the lowest side/eave of the roof. These are our preference because of their durability and strength. The size of the base needs to be the metric size of your building. For example, if you order an 8' x 10' building, the metric size is 2.4 x 3.0 metres and this should be the size of the base. If the base is not built to the metric size then you will see the base around the building, which can lead to water pooling. This is a cheaper alternative to our concrete bases, and it can be a good option if you don't want to have a permanent slab of concrete in your garden. 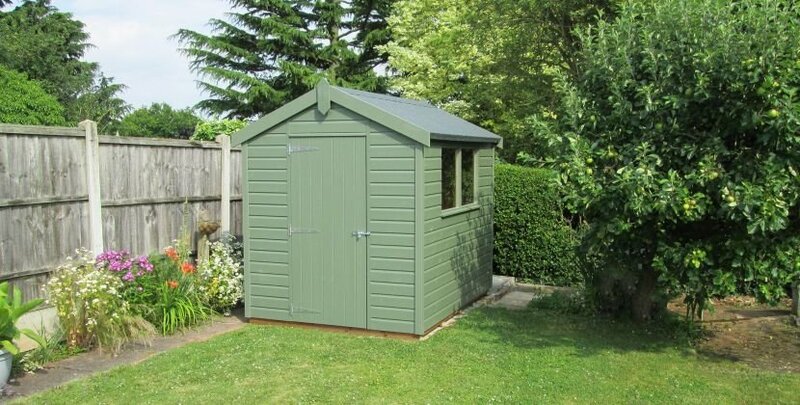 We only offer this solution with our Classic Sheds, as they aren't able to carry the same weight as a concrete base. This is the cheapest option for supporting your new shed: timber bearers are essential for longevity in lifting the shed away from surface water and damp. You don't need bearers as well as a base, but if you already have a base in place that is bigger than the building you intend to put on it, we recommend having timber bearers to lift the building up from any water that will sit on the base. Side Walls - ex 19 x 125mm shiplap cladding on ex 38 x 50mm planed framing, using high grade Scandinavian Redwood. Doors - Our Classic Shed doors are ledged and braced, and are hung with 3 @ 300mm zinc plated T-hinges and secured with a pad bolt. A single door measures 760 x 1700mm opening, and a double door sets measures 1520 x 1700mm opening. Door Frame - ex 50 x 75mm planed. Windows - 610mm square set in a joinery made window frame fitted with 4mm toughened safety glass. You can opt to have no windows. In the 4 x 6, 5 x 7 and 6 x 6 you get 1 window. In the other sizes you can have 2 windows. Floor - ex 19 x 125mm tongue and groove floorboards set on ex 38 x 50mm tanalized planed floor joists. Roof - ex 19 x 125mm tongue and groove matchboarding on ex 38 x 50mm planed framework covered with propane torched on heavy duty roofing felt. Height - 1.70m to eave height. Paint Options - Your building comes fully treated internally and externally with a light oak preservative as standard, which protects the timber against fungi and woodworm. Alternatively, you can opt for a painted micro-porous finish for extra colour and protection with our Classic paint range colours (Mint, Moss, or Stone).